Pluggable on socket with a withdrawal clasp and two guide pins. * flashing frequency : 60 to 120 beats per minute at nominal voltage (possible reduction of the frequency connecting an external capacitor between terminals B1 and B3). 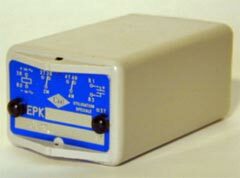 This relay is specifically designed for the switching of incandescent lamps.
. EPK relay with specific characteristics (voltage, rythm, ajustable period).